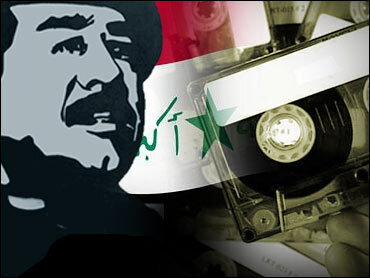 An audiotape purportedly made by Saddam Hussein told Iraqis on Sunday to step up their resistance to the U.S.-led occupation, saying the United States and its allies misjudged the difficulty of occupying Iraq. The CIA said it would analyze the tape, broadcast on the Arabic language television station Al-Arabiya. President Bush dismissed it as "propaganda." "I suspect it's same old stuff. It's propaganda. We're not leaving until the job is done, pure and simple," Mr. Bush said. "I'm sure he'd like to see us leave, if in fact it's his voice. I know the elements of the Baathist party, those who used to torture, maim and kill in order to stay in power would like to see us leave." The speaker, who sounded like the ousted Iraqi leader, told Iraqis that the "road of jihad (holy war) and resistance" is the only one to make the "armies of the unjust occupation leave our country." He also criticized Iraqis who cooperate with coalition forces, calling them "stray dogs that walk alongside the caravan" and who lack even the "minimum political weight" to "walk in the streets of Baghdad or any other Iraqi city." "We tell them that Iraq has a special `chemical mix' that can only be deciphered by the believers among the sons of Iraq," he said. A news editor at Al-Arabiya said the recording was delivered to the station via telephone a few minutes before it was aired. A person called the station Sunday and played the 15-minute tape, the news editor said, speaking on condition of anonymity. "We don't even know if the call was from Baghdad or any other place," the editor said. During the broadcast, the speaker used Saddam's old rhetorical styles, including indirect references to President Bush and Prime Minister Tony Blair as "liars" and calling the White House the "Black House." He began by greeting the Iraqi people on the occasion of the Islamic holy month of Ramadan and said the "evil ones will not be able to occupy and colonize Iraq." "They thought and made others think that they were going on a picnic to occupy Iraq and destroy their weapons of mass destruction," the voice said, denying that Iraq had any such arms. "Iraq will rebel against their evil intentions to colonize it and to wield influence in it," he said. "The evil ones now find themselves in a crisis and this is God's will for them." He added that "the aggressors have no choice but to leave our nation" and called on "mujahedeen," or holy warriors, to strike coalition forces "even harder." "The path of resistance is the path of choice to God and the people," he said. The speaker made an apparent reference to the U.S. plan to speed the transfer of political power to Iraqis, which was announced here Saturday. The speaker said that attacking "agents brought by foreign armies" takes precedence over attacking coalition armies themselves — a clear call to target Iraqis who work for the U.S.-led coalition or government ministries. Referring to coalition forces, the voice said they would "only reap disappointment with more and more American lives lost." "The land and fire of glorious Iraq that God has blessed with jihad because of valor in resistance... will swallow hundreds of thousands of troops that ... will never achieve their plans."